Mythologies is a masterpiece of analysis and interpretation. 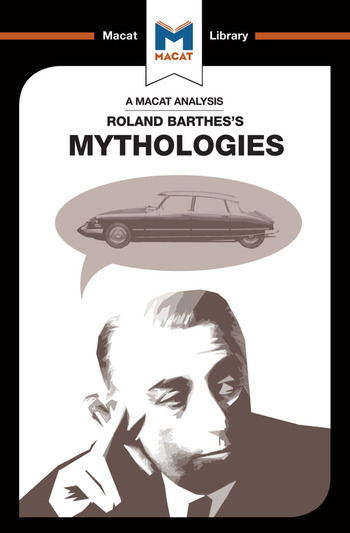 At its heart, Barthes’s collection of essays about the “mythologies” of modern life treats everyday objects and ideas – from professional wrestling, to the Tour de France, to Greta Garbo’s face – as though they are silently putting forward arguments. Those arguments are for modernity itself, the way the world is, from its class structures, to its ideologies, to its customs. In Barthes’s view, the mythologies of the modern world all tend towards one aim: making us think that the way things are, the status quo, is how they should naturally be. For Barthes, this should not be taken for granted; instead, he suggests, it is a kind of mystification, preventing us from seeing things differently or believing they might be otherwise. His analyses do what all good analytical thinking does: he unpicks the features of the arguments silently presented by his subjects, reveals their (and our) implicit assumptions, and shows how they point us towards certain ideas and conclusions. Indeed, understanding Barthes’ methods of analysis means you might never see the world in the same way again. Six skills combine to make up our ability to think critically. Mythologies is an especially fine example of a work that uses the skills of analysis and creative thinking. Dr John M. Gómez was awarded his PhD by the University of Cambridge for a thesis on recorded music, literature and modernity from 1914 to 1955. He now travels widely to DJ Brazilian jazz, and divides the remainder of his time between homes in London and Madrid.